According to the 2013 Norton Report, consumers are more mobile than ever, but are leaving security behind. Despite the fact that 63 per cent of those surveyed own smartphones and 30 per cent own tablets, nearly one-in-two don't take basic precautions such as using passwords, having security software or backing up files on their mobile device. 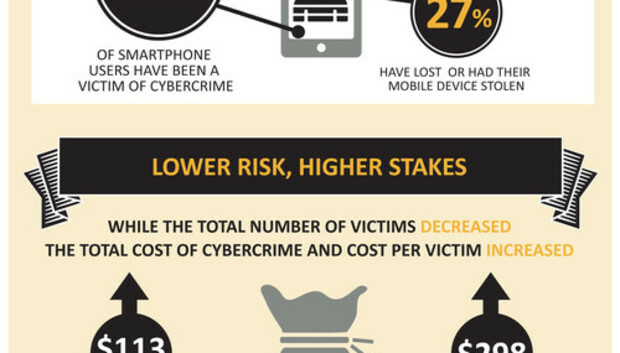 The report states that cybercrime continues to be a growing global concern. Both the total global direct cost of cybercrime (US$113 billion; up from $110 billion) and the average cost per victim of cybercrime ($298; up from $197) increased this year. The report also found that as people are now constantly connected, the lines are blurring between their personal and work lives, across multiple devices and storage solutions. Nearly half (49 per cent) of the respondents reported using their personal devices (PCs, laptops, smartphones, tablets) for work-related activities. The below infographic graphically illustrates some of the findings.